Brothers, Chris & Matt Kidd exploded onto the global dance scene in early 2006 with their huge hit 'Horizon' co written with Rob 'Activa' Stevenson on the massive Liquid Recordings / Spinnin. With support from many of the worlds leading trance and hard dance DJ's and compiled on more than 20 compilations this has become an anthem and was a promising start for the duo. Chris & Matt are now very much cutting out their own unique sound. Their productions contain a modern fusion of trance and tech all rolled into one captivating sound. All their productions have been supported and compiled by some of the worlds biggest DJs in trance, tech trance and hard dance including Paul van Dyk, Tiesto, Yoji Biomehanika, Scot Project and many more besides. 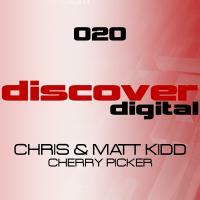 With this unique sound they now start a series of releases on the Discover labels with the excellent tech trance debut "Cherry Picker"
Tough and driving with equal amounts of depth and musicality thrown in for good measure this is a perfect start for the duo and their new production home. 'Cherry Picker' is available now from Beatport and iTunes.